The Ordinary Life of an Extraordinary Girl: NADS and Us! After Alex was born, but still in the hospital, we were visited by a social worker. She was employed by the hospital and her responsibilities included providing information to parents of newborns with special needs. Remember - this was before internet surfing and the only real way to do research was through book stores, libraries and phone calls. Since we were in a hospital - we had a huge number of questions! The social worker was able to answer some of our questions about down syndrome, but not all. What she did do though, was refer us to an organization called the National Association for Down Syndrome. From that day on, and until we left the Chicago area, NADS, as we call it, became the most important resource in our life. NADS, despite the use of national in its name, is a Chicagoland based not-for-profit providing support for individuals with down syndrome and their families. I took the following from their web site. Sheila immediately assured me – and she was the first person to do so – that Alex would have a full and complete life. Her exact words were “remember she is a baby first". She also told me of the school resources which were available immediately. She sent us all the information I could possibly ever need. Sheila sent us on our path as advocates and supporters of our special daughter. A path I will always follow. Equally important, Sheila recognized that we as parents needed support. She directed us to our local parents support group. NADS is involved coordinating these groups, but they really were created by a grassroots movement in the Chicago area to get parents together. These support groups are for the parents and the families, everything else was about Alex. We joined and met parents just like us, who did not feel odd that our children were different – all of our children had down syndrome. Although we do not live in the Chicago area anymore – I still follow these kids I knew as babies. 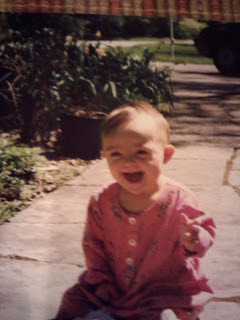 I know our group still exists and every family with a new baby with down syndrome is invited to join. I became a mentor to an adult with down syndrome, and I still stay in touch with Cindy, by e-mail. She lives in a supervised apartment with two other disabled adults and works at the local grocery store. She also participates in the Special Olympics and is a huge supporter of Alex’s accomplishments. Cindy opened my eyes to her life, one full of friends and happiness. She is an extraordinary person. Most rewarding though – I was able to see the commitment of the Executive Director and the very talented staff when I served on the Board. I learned the lessons of passion and caring. I tried to give back, to the best of my abilities and still hope to give back if I can. I was a Board member for four years - three of those as the Treasurer. I truly miss this organization. In closing, I know we have been very fortunate. Alex has good health, and we had the advantage of the services she received as a young child. We were lucky we lived in an area that had an organization like NADS. Again I wonder...Why isn’t this the case for every family with a child with special needs?